Do you get business cards or flyers in your letterbox from Real Estate Agents in your area? I’m sure you do. Everyone does. (I’d put a “No Circulars” sign on our letterbox but my wife loves to sift through the junk mail for a bargain). One of the most common is the postcard with a photo of a house in your neighbourhood with “Just SOLD” emblazoned over the top. Our local Real Estate agent is a bit different (be sure to tell me below in the comments if she’s not the only one). She sends us all a personalised newsletter every few weeks. And over the last few months she has been keeping us all up to date with the story of how she has been fighting with the council to make the intersection just down the road safer for pedestrians. A worthy cause. And yesterday, in her latest letter, she told us how she had won the battle and now there were 2 new pedestrian crossings going in this week instead of the planned 1. All thanks to her. Just wanted to say, thanks for pushing for the dual pedestrian crossings for our community. You’re a gem. Thanks for your email and promise not to ask if you want to sell your home, isn’t it a neat community to live in? Just remember me if you do. Wow. I admire their persistence. I admire their networking skills. I admire how they don’t let an opportunity slip by. But omg they are annoying. What do you think? What cunning advertising have you seen a real estate agent use? How can you turn the evil that-is-the-Readers-Digest-Sweepstakes into good? 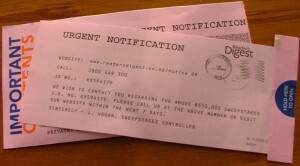 If you are human and you have a letterbox (or even a pile of bricks at the start of your driveway that someone could stick a letter into), then chances are, you have received one of these Readers Digest Sweepstakes letters. If you haven’t, then I am amazed. 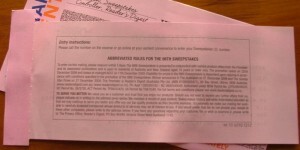 So, what can we learn from Readers Digest Sweepstakes letters that you can put to work on your business? This is the 96th time they have run the sweepstakes. Would they run it year after year if it didn’t work? No. Do other companies run ads that don’t work again and again? Well actually, yes they do. Many companies don’t bother to measure the response from their advertising. Most of them don’t bother because it seems to hard. This is genius because they could even test 2 different versions of the flyer at the same time by providing one 0800 number for one part of the country, and another 0800 for another part of the country. The flyer that generates the most calls becomes the new default, and next time they can test another change. Another way you could measure the impact of your ad is to use a mini-website instead of an 0800 number as the call to action, so you can see exactly how many hits you get via different promotions delivered to audiences on different dates. What efforts have you made to make your ad stand out? Actually, rather than cheesy gimmicks like this, I favour writing headlines that capture the audiences imagination, or tap into a deep psychological need, or create an itch that begs to be scratched. 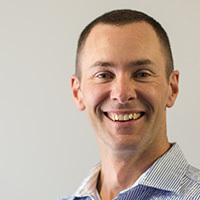 I’ve found that an effective headline can weed out the time wasters, lock into the true prospects, and give you a chance to deliver more message. 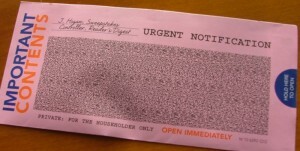 This is where this letter really shines. They don’t try and sell the Readers Digest Magazine. They don’t even mention it. All they are selling is your chance to win a jackpot. That doesn’t seem like selling at all! It’s like they are doing you a favour for giving you the chance to claim a prize that has already been reserved for you! Ok, ok, in this case, they have thrashed this concept to death, so many of us know that all that awaits us once we get through this hurdle is another hurdle and another hurdle until we are so exhausted that when they ask us to buy a magazine subscription we agree just out of pure exhaustion. Anyway, focus on the lesson: This letter has one purpose: to get people to call the 0800 number and graduate through to the next step in the sales process. Any information that does not achieve this objective does not belong in this letter. Are you guilty of trying to cram information into your ads? Sure you are. We all are. Are you trying to tell them about your company, about your products, about what you can do for them, and trying to convince them to make a decision on the spot? Can you boil down what you have to offer into one simple step that your prospects can take? 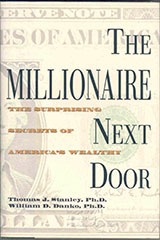 What can we learn from this book published in 1996? Quite a lot actually. Do live below your means? Do you allocate time, energy, and money efficiently in ways conducive to building wealth? Do you believe financial independence is more important than displaying high social status? Do you provide economic outpatient care for your adult children? Are your adult children economically self-sufficient? Are you proficient in targeting market opportunities? Have you chosen the right occupation? 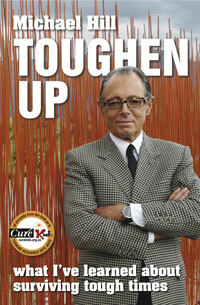 The secret to his success is setting goals, and then taking bold steps to achieve them. He’s a very goal oriented man. Goal 1: 7 stores in 7 years. Achieved. Goal 2: 70 stores in the next 7 years. Achieved. Goal 3: 1000 stores by 2024. I think he’ll achieve it. He’s got balls of solid gold. He’s loving the recession because it means he can buy up prime US locations for his stores that he never would have been able to afford previously. 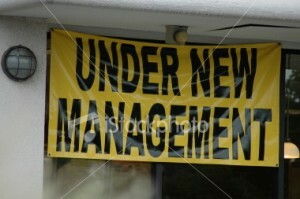 When you see the sign “Under New Management” plastered all over a businesses signage what do you think? Do you think: “Damn! Jack and Jill were awesome, I will miss them very much, I wonder if the new guy is as friendly or shall I try Bill and Bev down the road?”? What are the new owners trying to achieve with this message? And what is the actual effect? 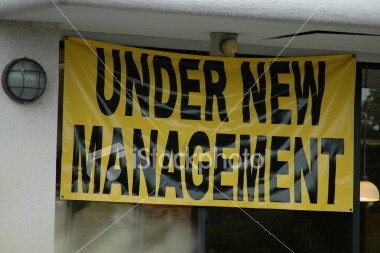 Maybe it’s just an excuse to put the word “New” somewhere. Most people are attracted to the word “New”. Maybe it’s a challenge to old customers and new customers: “Expect some changes here, assume they are for the better, come in and give us a chance to impress you”. Do you have an idea for a better sign? Do you want to be able to accept credit card payments? Want to avoid spending the big bucks on getting your website redesigned with ecommerce functionality? Just want to provide a simple “Buy Now” button for your customers? If so, you’re in luck, because today I have been researching all the different credit card transaction processing companies in NZ for a client, and thought you might like to know what I’ve found. Internationally recognised, always updating and improving their code and security. Polished. But: You have to withdraw funds from your PayPal bank account manually, and they reserve the right to charge a fee to send it to a non-US bank account (they don’t tell you what the fee will be). Australian based with a decent NZ presence. I’ve been using them for 3 years. Pretty basic, but good. Bonus: The funds are deposited straight into your bank account. Polished website. Very good price. Looks ok. Lowest monthly cost. Crap website put me off completely. Unknown. I didn’t stay long enough to find out. It’s a bit of a worry that their link to their FAQ page is dead. If they make errors like that on their website, will they be careful with our money? No pricing on their website. That is so lame. No, I won’t call your friendly customer service team. Have you used any of these companies? Tell your story. Don’t you think it’s amazing how much gold people will pay for your junk? Do you want to squeeze every last dollar out of each TradeMe sale? You are about to find out how. Above the funnel is the entire TradeMe audience. 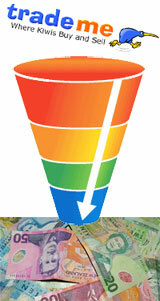 Your task is to push a volume of prospective buyers down your funnel. Here are 6 simple but cunning tips about how to turn your junk to gold using TradeMe. For the few days before you list your item, check out the competition. What headline are they using? How can you improve on it? What extra keywords are they missing? What photos have they taken? How can you improve the angles and detail? What questions have bidders asked? Avoid annoying them by answering these questions ahead of time in your description. What do they say in their description? What extra details are they missing? Can you tell a story (about the reasons your selling) or write something amusing? You task is to learn from their mistakes. This catches a lot of people at home in the earlier stages of the auction, and more importantly, they’ll all be back again next Sunday afternoon for the closing minutes. If your auction ends on a weekday, or too early in the morning, or too late at night, you will miss out on that bidding frenzy in the closing minutes. I mean over-the-top honest. When you describe the defects and imperfections in detail, buyers get giddy with trust and bid more. Your natural tendency is to not mention these defects. You think it will scare some people off. Sure, some people will be scared off. Let them go. Lot’s more people will be attracted like seagulls to fish n chips. So fight your instinct to hide the defects. This tip will make you money. 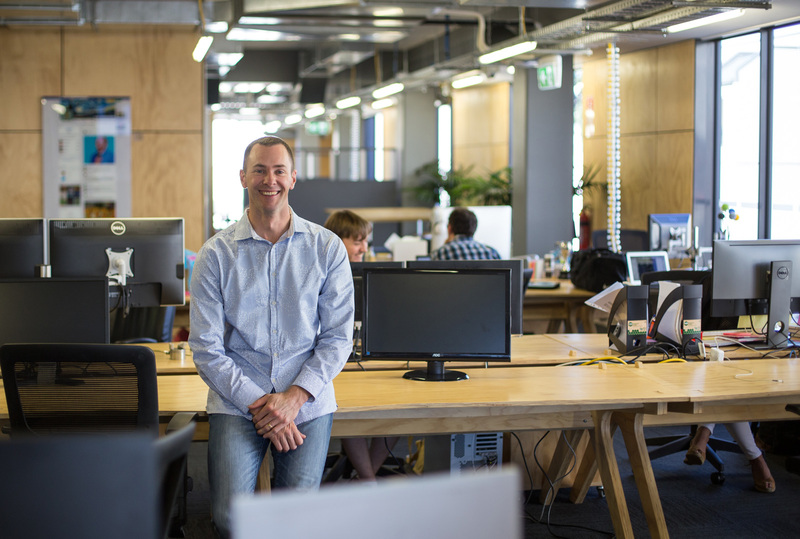 What is the number one reason people flock to TradeMe in their millions every day? And nothing screams “BARGAIN! !” more than “$1 No Reserve”. Put “**$1 NO RES**” at the end of your title. This works because it gets bids very early – within hours of listing you should have a few. And most important of all, each person who places a bid is automatically adding your auction to their watchlist, so they will get emailed next week to say your auction is about to close. That gives them another chance to make another bid, and that’s when you get a last minute bidding frenzy. I know, I know, it’s a little bit scary selling at $1 No Reserve. But if it really isn’t working out for you, know that you do have the option of withdrawing the auction (TradeMe will charge you a $3 withdrawal fee). Yes, yes, it is a bit cheeky that TradeMe charges you an extra 10c for photos these days, but its worth it. Upload about 5 photos of your item from a variety of angles. Include a few photos of all the items laid out nicely on a table, photos of the packing/box, and most importantly: close-ups of any defects or damage – this is less about being honest and fair and doing the right thing (although that’s important), and more about boosting your credibility so the bidders trust you more and bid more. This adds a photo beside your listing, TradeMe says its “twice as likely to sell” (and I believe this claim), the title is bold, and it features your auction first in the categories. This is a classic Return on Investment decision: ask yourself the question “will I get more than $4.00 extra for my auction with this extra exposure?” Yes, yes you will. That’s it from me. What other ideas can you think of? How Many Things Can A Restaurant Do Wrong and Still Stay In Business? The jugs of water that were served when we arrived were at room temperature. No ice. No lemon. When the waitress came back with our meals she had to ask who ordered what. Is it that hard to remember who ordered what? However, the food was delicious, fresh and tasty. I have no problem with the chef. But the service was terrible. How tight-a-ship do you run? Do you pay attention to detail in your business? Have you let your standards slip over time and hoped that no-one will notice? Maybe it’s time for a spring clean? Maybe it’s time you got a fresh pair of eyes to look over your business?